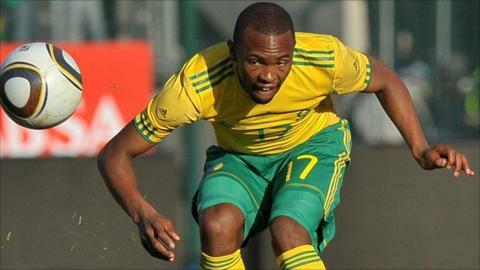 South Africa created a multitude of chances in a 2-0 win over Mozambique in a friendly in Nelspruit on Tuesday. It is new coach Gordon Igesund's first victory in his first home game in charge of Bafana Bafana. Striker Bernard Parker swept a low shot past goalkeeper Nelson Logomale in the seventh minute and added a second in the 88th at Mbombela Stadium. The win kick-starts Gordon Igesund's reign ahead of South Africa's hosting of next year's Africa Cup of Nations. "I'm satisfied. We did OK but we weren't great," Igesund said. "I'm happy that we won the game." Mozambique's best chance of the first half came through Helder Pelembe's dipping long-range shot which skimmed the crossbar. Substitute Sidique Ismael then had a close-range attempt cleared off the line in the dying minutes. But without seven regulars who were released back to their clubs, Mozambique couldn't match the impressive performance in African Cup qualifying over the weekend when they beat Morocco 2-0 in Maputo. The visitors also lost captain Almiro Lobo a minute after Parker's second goal when he was shown a second yellow card and sent off for a high kick at South Africa's May Mahlangu. For Igesund, it was a relieving first win after Bafana lost 1-0 in Brazil in a battling performance against the five-time World Cup winner on Friday. "At the end of the day we've played two games, one against Brazil which I was very pleased about, and then this result," he said. "It's something to build on. We want to be a machine come the African Cup of Nations." Igesund has been tasked with lifting South Africa's national team for the continental championship at home in January and February after an erratic time under former coach Pitso Mosimane, which was marked by the failure to qualify for the 2012 Nations Cup. Meanwhile, in a friendly to mark Liberia's Independence aniversary, the Lone Stars beat a strong Ghana side 2-0. Za Krangar, the Indonesia-based forward, scored both goals. The match was the second edition of the President's Cup in honour of Liberian leader Ellen Johnson-Sirleaf. Ghana won the first edition which also had Guinea participating last year.